An exclusive burial-place for the members of a family. The desire of the ancient Hebrews to "lie with their fathers," and particularly the charge of Jacob to his sons to remove his body from Egypt and to bury it in the Cave of Machpelah, furnish early evidence of this form of sepulture. 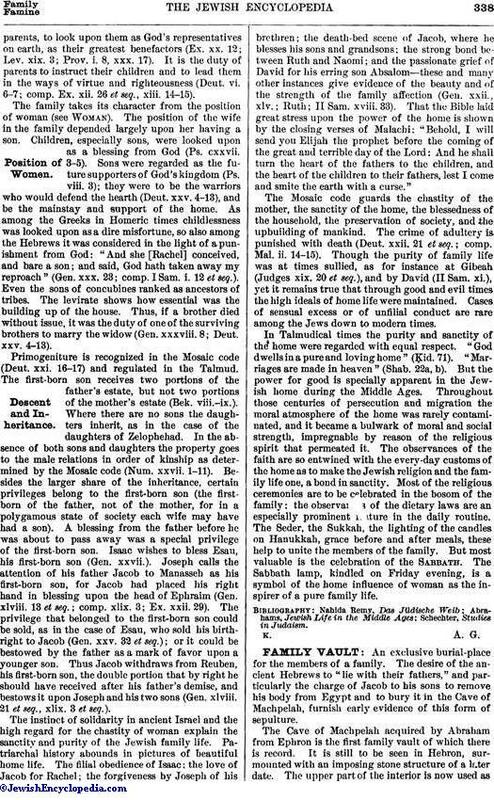 The Cave of Machpelah acquired by Abraham from Ephron is the first family vault of which there is record. It is still to be seen in Hebron, surmounted with an imposing stone structure of a later date. The upper part of the interior is now used asa mosque. Those who are not Mohammedans are not allowed to enter the cave, though an exception was made in favor of the Prince of Wales in 1861. Beneath the surface of the ground is the cave where the Patriarchs are supposed to be buried. Rab and Samuel of Babylonia differed as to the architectural style of the Cave of Machpelah (lit. "double"): one said it was a cave within a cave; the other that it resembled a house with an attic. According to another opinion, the signification "double" refers to the couples buried in the cave; namely, Abraham with Sarah, Isaac with Rebekah, Jacob with Leah ('Er. 53a). There are numerous references in the Bible to the desire of the kings in Israel to be buried with their fathers. The king of the house of David had a separate burial-place "in the city of David." Hezekiah was buried in the "chiefest of the sepulchers of the sons of David" (II Chron. xxxii. 33). Palestine, owing to its rocky conformation, was an ideal place for elaborate and ornate rock-cut vaults. Nebuchadnezzar is said to have been persuaded to conquer Jerusalem because the mausoleums in the Holy Land were superior to the king's palaces in Babylonia (Sanh. 96b). An example of a magnificent sepulcher is that of Queen Helen of Adiabene in Jerusalem, erroneously known as the "Tombs of the Kings," and by the Jews as "The Tomb of Kalba Sabua." The best example of a family vault is perhaps the structure near the monument of Absalom, popularly known as the "Bet ha-Ḥofshit" (II Kings xv. 5), or as the burial-cave of Haggai, Zechariah, and Malachi, and, according to the Christians, as the "Cave of St. James." It is really, however, as is proved by the inscription recently deciphered (Luncz, "Moreh Derek," p. 130), the family vault of the priest Hezir, mentioned in I Chron. xxiv. 15. A cave at Meron, near Safed in Galilee, has a collection of chambers forming a small catacomb; and tradition assigns it to Hillel the Elder and his disciples. The plot is usually four by six ells or arm-lengths (1 arm-length = 24 inches), containing eight chambers, three on each side-wall and two on the wall opposite the entrance to the vault. Each chamber is four ells long, seven handbreadths high, and six handbreadths wide. R. Simeon said the usual size of a vault was six by eight ells, containing thirteen chambers, four on each side-wall, three opposite and one on each side of the entrance (see illustration below). A courtyard six ells square was provided above the surface of the vault, for the accommodation of the bier and funeral party. This yard had steps leading down to the vault. The latter style of sepulcher is mentioned in the Tosefta: "A sarcophagus cut in the rock . . . if built in the wall of the vault [= ]" (Oh. x., ed. Zuckermandel, p. 607). Apparently the ancient type of family vault with the kukin was no more in use and was quite unknown at the time of the rabbis of the Babylonian Gemara, who asked for an explanation of it (B. B. 8b). A criminal, condemned and executed by the betdin, was not allowed burial in his family vault, but was interred in one of the separate burial-grounds provided for the four grades of capital offenders (Sanh. ii. 5). The members of the Sanhedrin were all buried in one plot in Jerusalem. There are many caves wherein rabbis of distinction lie in groups. R. Simeon b. Laḳish took pains to mark these vaults for identification (B. M. 85b). Similar caves or vaults are found especially at Safed, where distinguished cabalists rest in peace together. 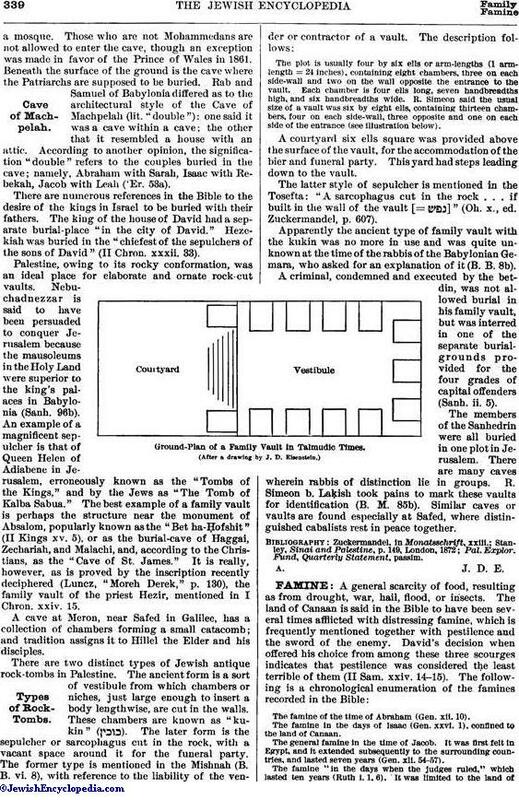 Ground-Plan of a Family Vault in Talmudic Times. Pal. Explor. Fund, Quarterly Statement, passim.